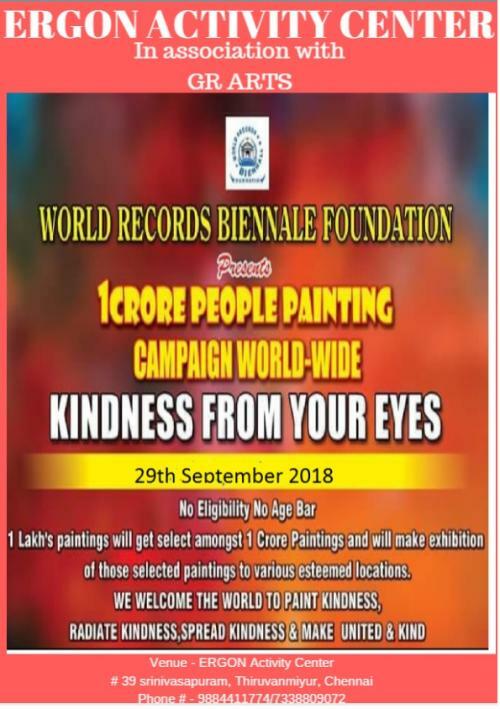 ERGON Activity Center in association with GR arts proudly conducts the ” 1 CRORE PEOPLE PAINTING WORLD WIDE CAMPAIGN” on 29th September 2018. ELIGIBILITY – No eligibility/No age bar. VENUE – Ergon Activity Center # 39 Srinivasapuram, Thiruvanmiyur, Chennai -41. MATERIALS – Please bring in your own materials . NOTE – From AGe 3 to 6 yrs you can sketch the topic, coloring should be done at the venue. Payment can be made at the venue on the day of the event.